Halloween is right around the corner, and it's easy to get caught up in the fun atmosphere of the season. If you're among those who can't wait to decorate your house with the latest Halloween offerings, then you're probably also anxious to find some great new ideas for making your own spooky Halloween treats. Here at Sweet Treat Supply, we've got all of the best supplies that you'll ever need to turn out the best Halloween goodies on the block. We've also found some spooky and delicious recipes for you to make that will be great for those little visiting ghosts and goblins and for your big Halloween party. Just click on the links for a photo of the finished recipe and easy step-by-step instructions. Ghosts in the Graveyard: This easy no-bake dessert is the perfect treat to make with your children, and you can make simple changes to show your creativity. Consider using this cool variety of spooky molds for your toppings. It contains molds for skulls, ghosts, Halloween cats, the mummy and a carved pumpkin. Halloween Tombstone Cupcakes: Everyone loves a delicious, moist cupcake, and you can't go wrong with this recipe straight from Betty Crocker. You can make them extra special by using these fun tombstones. Brownie-Banana Halloween Cupcakes: You can only make this Halloween treat better by adding your own homemade edible miniature Halloween decorations to the top. You'll get a nice assortment of skulls, bats, cats, scarecrows, ghosts and carved pumpkins. Your Favorite Cake: You don't need a recipe for these successful creations. Just mix up your favorite packaged or homemade cake recipe, and use one of our easy cake molds for the perfect Halloween treat. You may choose from our bat, skull or Jack-O-Lantern pans, or have fun with them all. Halloween Zombie Chex Mix: You'll want to make more than one batch of this popular Halloween party treat. Create your own special touch by adding in a few of these great sweet and salty treats to perfectly round out this great recipe. We know that you can't wait to get started on these amazing treats, so put in your order here at Sweet Treat Supply today for fast shipping. 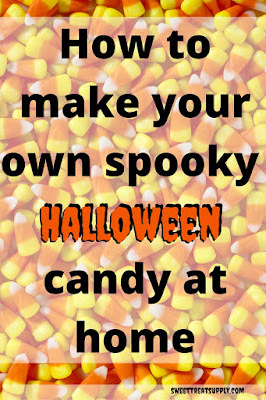 Do you have some great Halloween recipes of your own? We'd love to hear from you, so please comment below with any that you'd like to share.